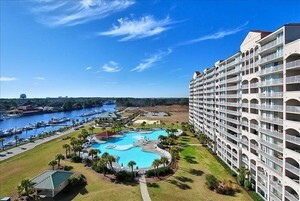 The Barefoot Resort Yacht Club Villas are some of the most luxurious high rise condos on the Grand Strand, and overlooks one of the largest pools in all of South Carolina. It also offers breathtaking views of the Intracoastal Waterway, filled with boats and lined with shops and restaurants at the very popular Barefoot Landing. These 3 & 4 bedroom condos are exquisitely appointed with designer furnishings and all the luxuries you would expect from a vacation property. Granite countertops, very large, spacious floorplans, full kitchens, washer/dryers, expansive private balconies, and much more all await you at the North Tower. The beach is less than a short 3 minutes drive, and during the summer months there is even a shuttle for your convenience. Within Barefoot Resort, you will find 4 Championship golf courses, along with a gorgeous clubhouse where you can enjoy lunch and a cocktail while taking in the beautiful view of the sculpted greens. 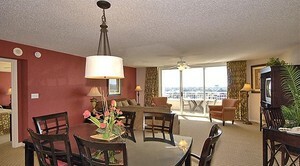 Across the waterway at Barefoot Landing, immerse yourself in entertainment and dining galore! Over 100 shops, restaurants and entertainment venues away you, including Greg Norman's Australian Grille, Alabama Theatre, House of Blues & much more! Listing courtesy of Keller Williams MB S. Realty , Evan Dua. Yacht Club Villas Tower 1 Bldg. Listing courtesy of eXp Realty Myrtle Beach , Hugh Bell.